I’m emerging blinking into the sunlight, as I have spent the past week or so constructing websites. It’s been an interesting learning-cliff-face, as I put myself through various crash courses in html and css. And no, before last week, I didn’t know what that meant either. I’m thinking of moving this blog. I dearly love wordpress.com and have enjoyed it. However, there are some things that I can’t do with it that I would like to. This blog is basically hosted by wordpress. I need to self-host in order to be able to tweak things and put new things in. So I’m going with wordpress.org! Huh? I hear you cry. Didn’t you just say….? Go back and read it more carefully. I can’t do what I want with wordpress.COM, but I can do what I want with wordpress.ORG. The .ORG version will sit on my own private webspace, and allow me to alter things how I want. In fact, I’ve already tried a test run. Not everyone knows this (and I don’t generally talk about it here) but when I’m not being an artist, I’m a plumber. So I thought I would build a static website using wordpress.org as a sort of dry run for re-vamping artbizness. 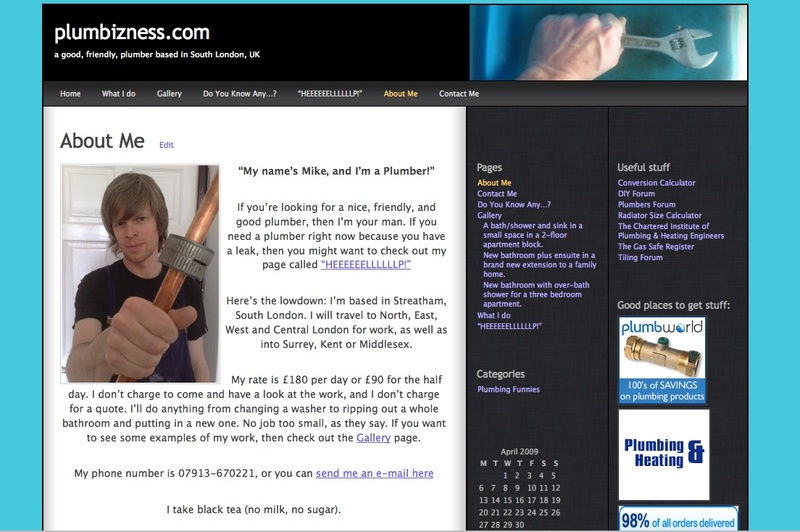 The plumbing website is called www.plumbizness.com. That’s a photo of it at the top. Go take a look and let me know what you think. In the meantime… I’ll be working on artbizness. I’m not going to move it just yet, but hopefully sometime over the next month. I’ll tell you where and when soon.